We remember the life and artistic legacy of Hassan Sharif who died on Sunday, September 18, 2016 in Dubai, United Arab Emirates at the age of 65. Sharif's exact date of birth is unknown, nor did it really matter to him. He didn’t put stock in conventions of age, identity or the need for comfort. Only art and the restless making of art grasped his attention. He was a prolific cultural producer and facilitator, moving between roles as artist, educator, critic, activist, and mentor. His career as an artist began in Dubai and Sharjah in the 1970s, working as a satirical caricaturist, highlighting a rapidly changing United Arab Emirates at the dawn of its formation. In 1979, Sharif was awarded a scholarship to the United Kingdom where he studied at the Byam Shaw School of Art and returned five years later to the UAE, with the goal of establishing an art practice and building an audience for contemporary art in the Gulf region. The young country was an unlikely setting for an artist with a taste for provocation but his work found exactly the resistance that stimulated him. With determination, Sharif began a life-long pursuit to expand the definitions of art and the role of artists. For his earliest experimental work of the 1980s, Sharif brought friends to the edges of Dubai to be the audience for his performances—jumping in the desert, tying rope between rocks—using apparently simple gestures to pointedly question ideals of technical skill, mastery, and accomplishment. Always questioning the functional and the useless, the found and the created, he transformed consumer products and waste into complex assemblages and weavings in his ongoing series, “Objects.” In these works, Sharif raised concerns about consumerism and social order, the human body and the physical evidence of our times. He was fascinated by the errors and flaws that arise in rigid systems, utilizing them in his large body of "Semi-system" drawings. Across his diverse work, he believed that flaws in such systems are ultimately creative ruptures. Internationally recognized as a pioneer of conceptual art and experimental practice in the Middle East, Sharif served as a colleague and mentor to generations of Emirati artists. He believed that art was not only practice to be expanded and shared, but also a catalyst for community. In the early 1980’s, he founded the Al Marijah Art Atelier in Sharjah, and was a founding member of the Emirates Fine Art Society and of the Art Atelier in the Youth Theater and Arts, Dubai. In 2007, he was one of four artists to establish The Flying House, a Dubai art space dedicated to promoting contemporary Emirati artists. The first Emirati to have his work shown in the Arab Museum of Modern Art in Doha, Qatar, Sharif was also among the selected artists to represent the U.A.E. during its first national pavilion at the Venice Biennale in 2009. Sharif’s artwork is included in the collections of the Centre Pompidou, Paris; M+ Museum, Hong Kong; Mathaf: Arab Museum of Modern Art, Doha, Qatar; the Sharjah Art Foundation, Sharjah, U.A.E. ; the Barjeel Art Foundation, Sharjah, U.A.E. ; the Sittard Center, The Netherlands; and Guggenheim Abu Dhabi, U.A.E., and Guggenheim, New York. 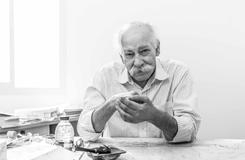 Hassan Sharif will be remembered for his gentle and generous spirit and his playful attitude, and his enormous contributions to contemporary art. The legacy of his artistic journey will inspire artists and audiences, having left an indelible mark on Middle Eastern art history and the global art world.